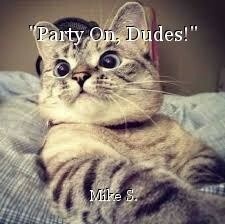 "Party On, Dudes! ", poem by Mike S.
Did you slip me a Mickey, Mickey? That invincibility is so far in the past. The worst of many nightmares that I’ve had for years. Would make my life more of a mess. Don’t push it now or I will go. Hmmmm......Yeah, I like it, Mike! Thank you much, from both of us, J.B! It's always fun watching poets collaborating. It's always fun what they come up with. Nicely done. Thank you from both of us, Christian!